Jeremiah 25:7 (ESV) "Yet you have not listened to me, declares the LORD, that you might provoke me to anger with the work of your hands to your own harm." When my daughter was 2 years old, my husband and I would tell her the same things over and over. "Hold the railing on the stairs!" "Don't grab the dog's tail!" And yet she still continued to do things her own way. Was she a typical 2-year-old? Of course. But was she also blatantly disobedient at times? Yes. In chapter 25 of Jeremiah, we see that God's people have heard His instructions and warnings over and over and over and over. Jeremiah chastises the Israelites: "'For twenty-three years … to this day, the word of the Lord has come to me, and I have spoken persistently to you, but you have not listened'" (Jeremiah 25:3). The call was simple: turn from evil, and obey the Lord. God has been warning His people "persistently" to repent through the prophet Jeremiah for 23 years, and through other prophets before him for years before that. But they refused to listen and obey God's word. Instead, their evil choices led to their ultimate betrayal of God: They worshipped idols instead of Him. The "work of [their] hands" was the creation of idols they formed. The word of the Lord through Jeremiah is pointing out this very thing as well — they have chosen lumps of gold and shards of wood over the Creator of all! This is why the "work of their hands" has provoked Him to anger. God warned them over and over to repent of their evil choices, but after years — decades! — of warning His people of the consequences of their sin, God, in His holiness, could no longer tolerate their idolatry. And so Jeremiah speaks of their coming destruction: "Therefore thus says the LORD of hosts: Because you have not obeyed my words, behold, I will send for all the tribes of the north, declares the LORD, and for Nebuchadnezzar the king of Babylon, my servant, and I will bring them against this land and its inhabitants, and against all these surrounding nations. I will devote them to destruction, and make them a horror, a hissing, and an everlasting desolation" (Jeremiah 25:8-10). The Lord is God and there is no other. 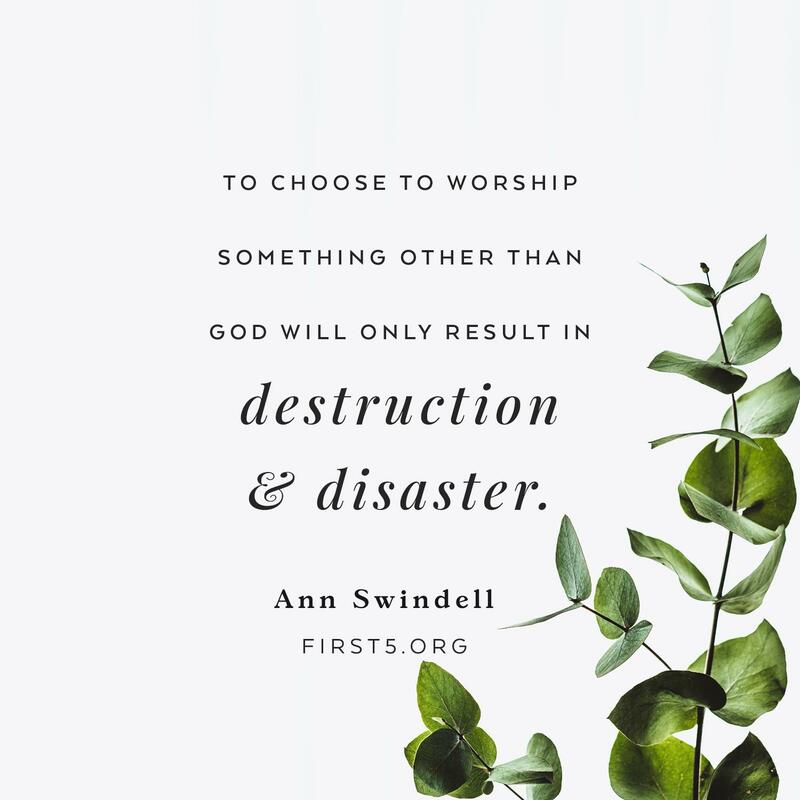 To choose to worship something or someone other than Him, to choose to worship something we make with our own hands, will only result in destruction and disaster. What is in your hands today that is stealing worship from the Lord? Is it a smartphone that is sucking your heart and time away from Christ? Is it a child that you have prioritized over God? Is it a resume that is pushing you toward earthly success rather than heavenly gain? Is it any passion, desire or thing that is drawing your heart away from Him? Jeremiah doesn't mince words with the Israelites, and so we can't either: The work of our own hands will destroy us if it is not for the Lord. My daughter had to learn the hard way to hold on to the railing and stop grabbing the dog's tail, yet there was still pain and frustration when she didn't listen to our admonitions. The Israelites didn't just learn the hard way — they lost the hard way. In fact, they lost everything when they ignored God's commands and warnings. They were so obsessed with worshipping the work of their own hands that they forfeited their relationship with God and His good plans for them. May that never be the case with us. May we put down anything drawing our hearts away from God so that we can follow where He leads with wholehearted devotion. Prayer: Lord, there is so much that I hold in my hands that distracts me from You. Please forgive me! Help me to lay these things at Your feet and obey You rather than my own desires. In Jesus' name, Amen.